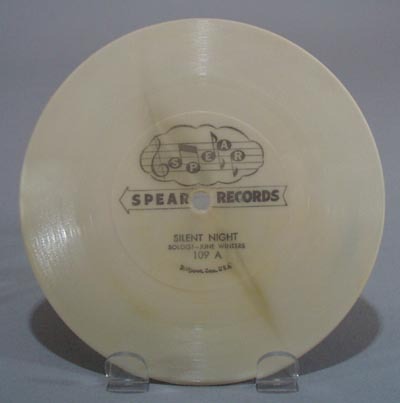 Spear Record, #109 We wish you a Merry Christmas, Deck the Halls, and Silent Night with solo June Winters. Record is White, it has a off color line through the plastic that is original to production. Bridgport Conn, probably from the 1950 era (it came from a collection where nothing was dated newer than 1956). Record is 6"", has some scratching, but still very nice. Items Similar To "Spear Record, #109 We wish you a Merry Christmas"